That was the day I left the home I had lived in for 57 years. That was the day I moved into a facility. Moving to a facility was not my choice. I was hot lined by an anonymous individual. A state social worker deemed that I was not safe in my house anymore. In a mere five days, life as I knew it ended. I’d lived in my house, with the assistance of caregivers, since the death of my mother in 2010. I was a library volunteer, I had an accessible van which allowed my caregivers to drive me wherever I needed to go. I was an author. I was also actively pursuing my goal of becoming a freelance writer. I loved going out to eat on weekends, catching a movie, or going to the mall. I wondered how living in a facility would change all that. I remember having a phone conversation with the social worker, telling them about my life, begging them to reconsider, but the decision had been made. There was nothing I could do. That final morning was extremely difficult. I was moving thirteen miles away from my home. I was leaving everything behind that was familiar to me. To begin a new life. Life as a resident of a facility. People told me life would be totally different in a facility. Nothing prepared me for how different and difficult life in a facility is. I am one of approximately thirty residents. My needs are no more important than anyone else’s. In order to survive in a facility, you must have a support system. I couldn’t make it in here alone. My family is always there for me. I have learned to advocate for myself in order to make sure my needs are met. I spend a lot of time waiting because in a facility, things are done when it’s convenient for the staff, not when it is convenient for me. Since moving to a facility, I have learned how to take the public transportation for the disabled. This enables to travel to the library where I have been a volunteer for over five years. I have used the service to meet friends for lunch and dinner too. At first, I missed the van a few times, because my aide was late in getting me up. Things are much better now. I am on time for the van. My life is outside of the facility. Social media allows me to stay connected to my friends and family. I would be lost without my laptop and Kindle. I spend a lot of time writing or playing scrabble on Facebook. I love to read. Reading can take you anywhere. I am always looking for new books to download to my Kindle. I am even exploring online dating for people with disabilities. Last Mother’s Day weekend, I was honored to be one of the cast members of Listen to Your Mother, a spoken word program honoring mothers and Mother’s Day. There were one-hundred applicants. I was one of the final thirteen chosen to read their essay. The show was performed in 39 cities across the country. It was a fun and exciting day. I got to pay tribute to my mother and thank her for all she’d done for me. I made some great friends too. I write essays for a non-profit organization called Voyce. This organization advocates for residents living in long term care communities. My essays shed light on what it is like to live here. I have always tried to contribute to my community. When I was told I would never get a job because I couldn’t take myself to the bathroom, I created a part time teaching position for myself. I worked for sixteen years in that position. I refused to let my CP stop me. Adapting to life in a facility is the hardest thing I have ever done. But, I refuse to let the fact that I live in a facility stop me from being productive. Yes, I live in a facility, but I have the same goal I have always had. To have the best life I possibly can. To make a difference. My address may have changed, but I haven’t. I’m still me. 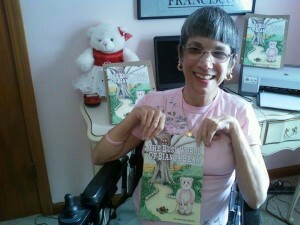 Joanne Grana is a blogger, author, and activist from St. Louis, Missouri.. She was the first severely disabled student to receive a master’s degree from the George Warren Brown School of Social Work at Washington University in St. Louis, and she has also written a children’s book, “The Busy World of Bianca Bear”. 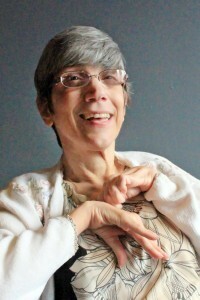 See more from Joanne, and check out her blog Confessions of a Disabled Diva.